Produktinformationen "Browne, The Stress of Chess"
Walter Browne is a living legend of chess, a hurricane of a player with a daredevil approach. Browne, famous for his hair-raising time-trouble duels, considers chess a natural cerebral high . By competing you are a winner, no matter the result is his motto. At the peak of his career Browne won the US Championship six times and claimed countless national and international tournaments. A regular and successful competitor in the World Series of Poker in Las Vegas, his achievements as a poker player are almost as impressive. In this memoir, Walter Browne recounts his formative years, when he befriended and played Bobby Fischer in New York City, and his later life on the road, when he trotted the globe, living life to the full. Sharing colourful anecdotes about chess legends such as Tal, Karpov and Timman, and his rivals in the rough-and-tumble of American opens, Browne looks back on a rich career. He presents his best games, full of sacrifices and fireworks, in a clear style that is easily accessible for amateur players. Walter Browne was born in Australia in 1949 and moved with his family to the United States in 1953. He became an International Grandmaster in 1969 and won the US Championship six times. He won hundreds of thousands of dollars as a poker player. 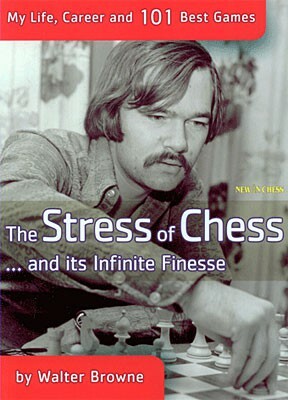 Weiterführende Links zu "Browne, The Stress of Chess"
Kundenbewertungen für "Browne, The Stress of Chess"